The Balanced Dog of Virginia offers dog training, dog behavior training, consultations, boarding, doggie boot camp, board and train, classes, and more. The Balanced Dog is a dog trainer and behaviorist based out of Bridgewater, Virginia and serving all of the Shenandoah Valley and beyond. You can sign up for Jessica's Dog Behavior and/or Therapy Dog Prep Class in Harrisonburg, Virginia with The Balanced Dog through Harrisonburg Parks and Recreation. Classes are typically held at the Simms Building located at 620 Simms Ave, Harrisonburg VA 24482! Spots fll quickly. Contact Harrisonburg Parks and Rec at (540) 433-9168 to reserve your spot today! We are excited to announce we are coming to Elkton later this year! 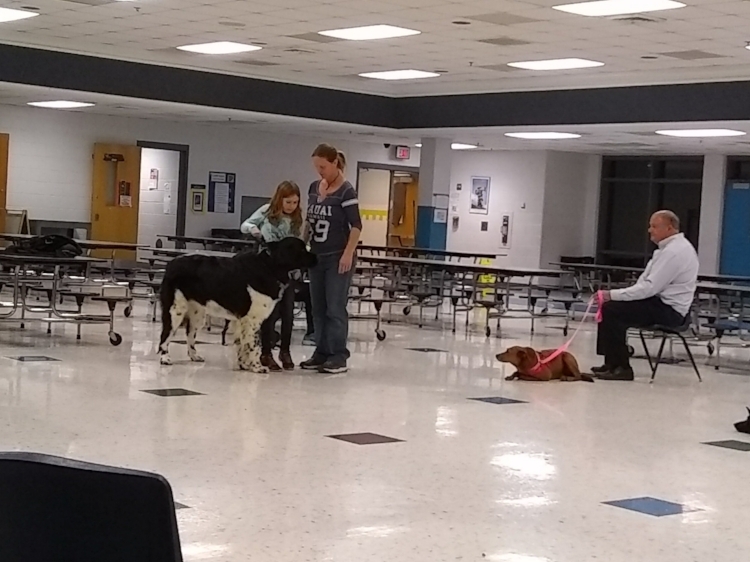 You can sign up for Jessica's very popular Dog Behavior classes in Elkton, Virginia with The Balanced Dog through Elkton Parks and Recreation. You can call them at (540)298-8730. Classes will be held at the Elkton Community Center located at 20593 Blue and Gold Dr, Elkton, VA 22827. Spots are sure to fill QUICKLY! Does your dog jump all over you and your guest? Does she lunge at the end of the leash when she sees other dogs? Does he pull you down the road and all over the neighborhood? Is she scared of everything? Does he want to fight with other dogs? Does she nip at you? Is he generally a pretty good dog but you want to teach him some extra manners? This is the class for you (and your dog of course)! Best of all, we will make time to discuss individual problems during class so that each participant gains something from the class experience. Have you thought about training your dog to be a therapy dog? Therapy dogs visit nursing homes, hospitals, schools, colleges, libraries, and other facilities to provide emotional support for those in need. Please note that they are NOT service dogs or emotional support dogs for the owner. These dogs provide support to others, aside from their owner. This course is designed to get you ready to take the certification test (offered at the end of class). This class is not suitable for dogs that are aggressive or dogs that do not like strangers. Deaf or blind dogs are able to become certified. Dogs must be one year of age or older to take the test. Human handlers ages 8+ are permitted to become certified with their dogs, but must be accompanied by an adult. Future dog trainer! Yes, kids are always welcome in our classes!